Made of Brass. 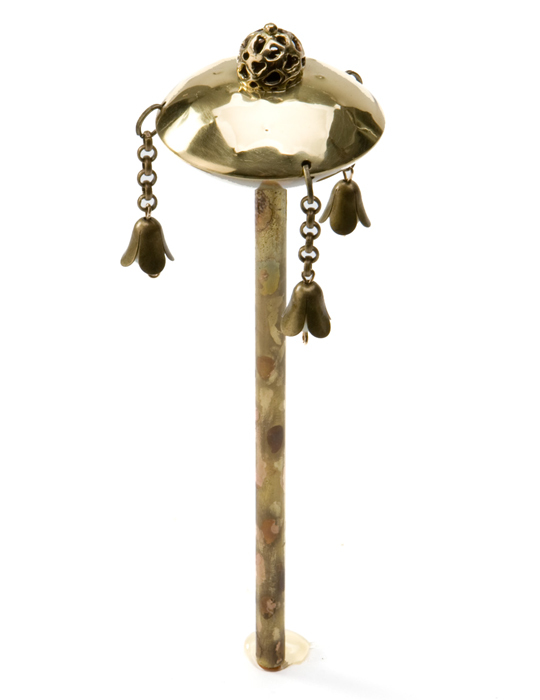 Decorated by fire stains (heating the metal in high temps and the natural colors of the metal come out).The top part of the metal is shiny with stamped designs.The noise is made from brass chains with brass bells combined with pearlsAll items are covered by lacquer to protect the work. Ayala Adler started working as a silversmith over 20 years ago. Ayala grew up in Jerusalem and the city has a deep influence on her spiritual and artistic expressions. After completing her military service, Ayala followed her love of art and started to sell her jewelry in the Tel Aviv Nahalat Binyamin Art Fair. Ayala's start in jewelry design led her to become familiar with most kinds of simple metals and in the process, sealed her love for creation of her artwork in these metals. As she became familiar with the world of Judaica, Ayala started creating Mezuzot with many different and exciting styles. Her varied techniques for working with metals include burning, fire spotting and the combining of different materials that color and/or affect the metal. Ayala Adler's complete line of Judaica made from simple metals now include such items as Mezuzahs, Dreidles, Groggers [Rattles] 'Yad <>La Torah', Candlesticks, Jewelry, and much more.